In 2-quart saucepan, make 1 pouch potatoes as directed on box. Stir in cheese. Set aside. In large bowl, mix meat loaf mixture ingredients. Press about 3 tablespoons meat mixture in each muffin cup. In small bowl, mix all sauce ingredients except parsley. Spread about 2 teaspoons sauce over meat loaf mixture in each muffin cup. Place potato mixture in decorating bag fitted with #847 or desired tip. Pipe potatoes on cupcakes (or just spread on with a spoon). Bake 14 to 16 minutes or until meat thermometer inserted in centre of cupcake reads 160°F. Sprinkle with parsley; serve immediately. 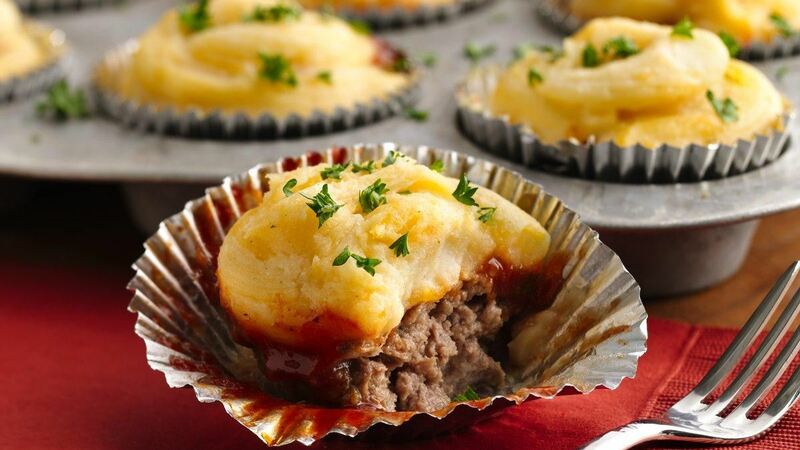 Success : Make sure to use extra-lean ground beef so there is less fat in foil baking cups after baking. Time-Saver: Skip the homemade sauce and just use, ketchup or barbecue sauce. Time-Saver : Skip the potato piping. Just spoon the potatoes over the sauce.